The brief: Tell us about 5 songs *and/or* films. It could be the ones you think are the greatest. Or that move you most. Or that are under-appreciated. Something along those lines. The people: Webstock speakers and assorted Webstock people. To me, Bach represents order, structure and peace. The Goldberg Variations in particular. People who know me well call this my “morning music” because I only listen to Bach at that time of day. Often while I write. It’s music for starting off with, gathering your thoughts, restoring balance. I’m also a big believer an habit for creativity. This, because it was the biggest musical surprise to happen to me in 2013. Beyoncé is one of the most interesting musicians working today and an incredible role model. Love. A much younger me would have eschewed pop music for not being cool enough or whatever, but that’s totally against my core beliefs about creativity today – that you need to let the unexpected in. Also, the message, the aesthetics, that dancing. Besides discussing the hard stuff that anyone who creates for a living thinks about: legacy, aspiration and prolificacy to name a few – the main subject is something I’m sure we’ve all felt – being put “in a box” for what you make. (Sorry pop music! I’m making up for it now!) Related to the issue of conformity and acceptance within one’s area, is an anecdote I heard from Congolese-Belgian hip hop artist Baloji the other day on NPR’s All Songs Considered podcast (featured at 20:45) – he says “hip hop is the most conservative genre of music I’ve ever encountered”. I love hip hop, and I also think that’s a wonderful lens to look at the industries we work in and the art we consume. This dark tune for the sheer courage it must have taken for Kelly to show this much vulnerability and record this song. ‘Nuff said. I love the irreverence of this track, and I also love it for its unconventional use of organ. There are two times in my life I thought, Damn, pipe organ! One was playing in the cello section of Poulenc’s Concerto for Organ, Timpani and Strings, the other was listening to this. Doesn’t it just make you want to run into one of those old European cathedrals, crank this, and get down? Things are going to be a lil’ different this year at Webstock. New venue, new format, new lots of things. Here’s the low-down on some of the stuff that’s new. So we fell in love with the atmosphere of the St James. It’s beautiful. 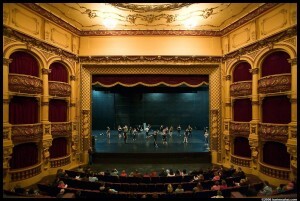 It’s the home of the Royal NZ Ballet and they know a thing or two about putting on a good show! It’s resplendent. It’s got character up the ying yang. It’s got theatre-style seating, rather than the round table thing we normally do. So this will be fun and different, and more akin to a theatrical experience. Which is kinda the vibe we’re aiming for. 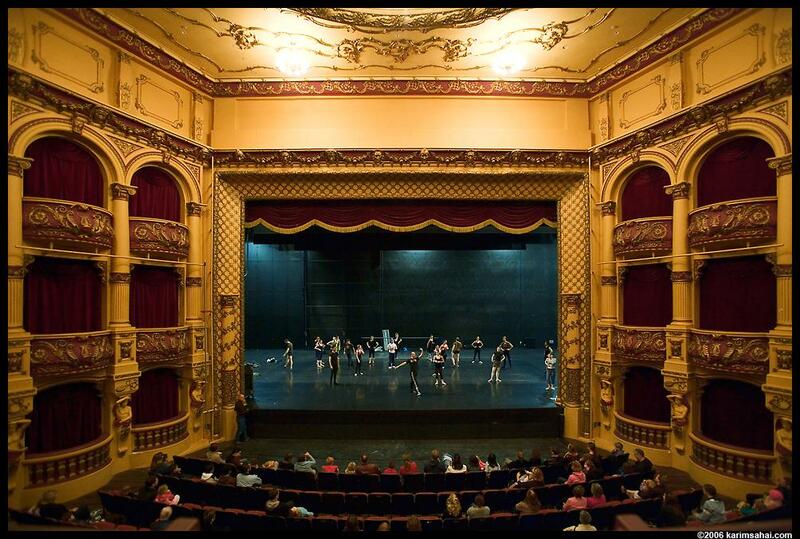 Webstock ’14 speakers rehearse this year’s closing dance piece in the St James Theatre. We’re doing a single stream conference. 30 minute presentations. No more difficult decisions re which talk to attend. You can see ALL OF THEM! Neato. While there’ll be wifi galore and power plugs a plenty available in breakout areas, we’re gonna be wifi-free in the main auditorium. This is to aid in your glorious Webstock experience: sometimes all that wifi, and tweeting, and blogging and people playing World of Warcraft next to you, can get in the way of experiencing something awesome. And that’s what we hope you’ll be doing – experiencing awesomeness. Guess what? We’re not doing bags this year! 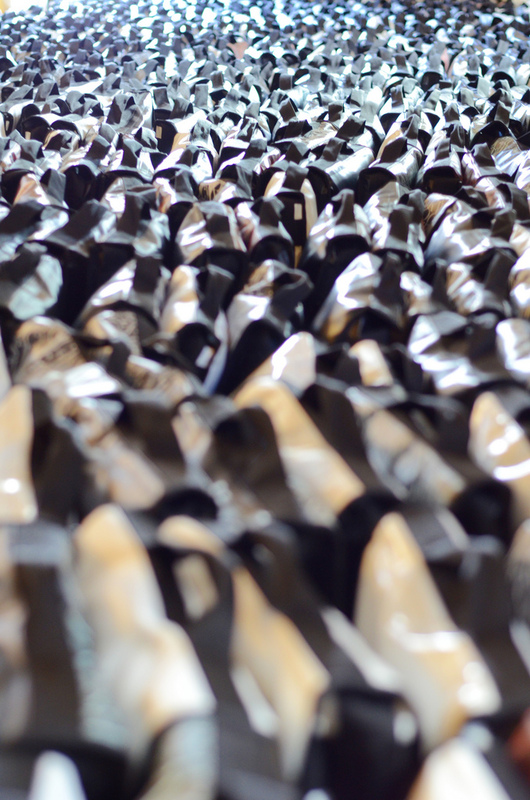 Yep, we’ve finally taken on board lots of feedback from the past few years about HAVING TOO MANY Webstock bags. Tash’s collection of Webstock bags. She can’t get into her bedroom. So we’re taking a break this year and doing something else instead. We really really really REALLY hope you like it! And there will be bags from past years on sale at steal prices! Plus lots of other Webstock paraphernalia. Let us embrace this newness while we relish in all the other usual stuff that makes Webstock really rather good! We reckon it’s gonna be choice. Can’t wait. Eight sleeps to go! YAY! We’re delighted to have AccessibilityOz involved with Webstock as a sponsor this year. Accessibility has been at the heart of Webstock’s interests since our first conference, way back in 2006. We talked with Gian Wild, founder of AccessibilityOz. 1) Tell us about AccessibilityOZ, how you came about and the work you do. I’ve been working in the accessibility industry since 1998. I had run my own company before – but it was ten years too early to run an accessibility consultancy! I was working at Monash University as head of their Usability and Accessibility Services division when the Australian Government Information Management Office (AGIMO) released their National Transition Strategy in 2010. Basically it required all Government sites and applications to be Level A accessible by December 2012 and Level AA accessible by 2014. After that was released I was constantly fielding requests from clients, and of course there was only so much I could do while holding down a full-time job! Monash was great, and they were happy with me doing outside work, but by March 2011 I had to choose between the two! 2) What are the major accessibility issues on the web right now? And have things improved over the past 5 years? One of the biggest accessibility issues in the web right now is video. We continually see accessibility problems with video players – in fact in all our research we never found an accessible video player! So we decided to build one! To see what I mean, try using your current video player with the keyboard only (by tabbing from link to link). You’ll find that the video player traps the keyboard (so that the user cannot go anywhere with the tab key and has to close the browser and start again), or really important functions, like turning on captions or audio descriptions, can’t be accessed by the keyboard. If you’d like to know more about inaccessible video players, have a look at our video. Captions and audio descriptions are also an issue, as both are required if you want to meet Level AA of WCAG2. Another big accessibility issue is mobile. It’s a complex accessibility issue as following WCAG2 in your site won’t necessarily create a mobile-friendly site, and there are other accessibility requirements (such as the ability for everything to be touch-accessible) that just aren’t covered in the W3C Guidelines. We have to use a combination of the W3C Mobile Web Best Practice Guidelines and the Draft BBC Mobile Accessibility Guidelines to test mobile sites. 3) If you could give web designers one piece of accessibility advice, what would it be? Test colour contrast! We’re continually going back and forth with designers about the colours they use. It’s not particularly onerous to meet colour contrast requirements; it still allows for some impressive use of colour (have a look at Victoria’s Volunteering Portal if you don’t believe me!). There are two great tools to test colour contrast and they’re completely free. The first one is Juicy Studio’s Luminosity Colour Contrast Analyser, which allows users to enter hexidecimal colour values for testing. The second one is The Paciello Group’s Colour Contrast Analyser which has a colour picker so you can select colours and determine their contrast. 4) If you could give web developers one piece of accessibility advice, what would it be? 5) You’ve developed OzPlayer, the world’s first fully-accessible video player. Can you tell us a little about what it does and how it works? For more information, have a look at our video. 6) What are you most looking forward to at Webstock this year? It’s my first time at Webstock. I have been meaning to attend for years, and I’m just glad I finally made it happen! I’m really interested in the opening keynote: Scott Berkun and The Year without Pants. Our offices are distributed around Australia and a number of us work from home. It’s heartening to see a big company doing the same; I really think that is where work is headed. I’m also looking forward to Stick Around and Fix It, because we are definitely not a startup anymore (we’ve been around three years in April), and there are different challenges to running a business once it has been established. And, personally, I’m very interested in Sometimes You Need to Draw Animals, because running a small business always seems to lead to burnout! The New Literacies looks great – as I’ve constantly wondered how the medium makes the message. And, of course, I can’t wait for the closing keynote: The Meaning of Life! One of the world’s great questions, and it’ll be answered by the end of next week! Thanks Gian! We look forward to seeing you at Webstock next week. This is our third year of Start-Up Alley, in conjunction with BNZ. There were 38 entries this year, an increase of 10 over 2013. And they were really good! So much so that we increased the number of finalists to 10. We’d love to showcase everyone, but here’s the 10 finalists. Good luck everyone! Hoist is stoked to be part of Start up alley and we can’t wait to show you all what we’ve been working on. Come along and say hi! We’re bewildered this is actually happening, and super excited to attend Webstock. This is just the beginning though, and we hope our passion for positive media spreads. Yay! The InfluxHq.com team is humbled and excited to have been selected for Webstock’s Start Up Alley. We’re looking forward to learning from and sharing with the startup and broader web community at this epic event. Planet Goodness is an online marketplace for NZ’s best eco and ethical products, with a portion of every sale going to the community. We are super excited to be a finalist (thanks heaps!). We look forward to going to Webstock to learn about, and get feedback on, how we can use the web for good. For what started off as a small school project to help simplify my school’s parent teacher interviews, I’m absolutely thrilled that Parent Interviews has been selected to attend Webstock as part of the BNZ Startup Alley. Start-Up Alley comes at the perfect time for SpeedCurve. It’s a bootstrapped side-project created late in the evenings now ready for it’s tyres to be kicked. Really looking forward to contributing to what has been an amazing conference from day one. There will be speed battles as attendees get to face off, frontend to frontend! Skowt is an online booking system for rentable spaces. We are thrilled to be a finalist in this year’s Start-Up Alley, and are excited about the opportunity to receive valuable feedback, insight, and exposure. Come and find us during Webstock, we would be delighted to show you more. Thankyou Payroll is a social business providing free, cloud based payroll intermediary service to SMEs and charities all over New Zealand. We love innovation and creative solutions, which is why we’re stoked to be a part of the goodness at Webstock’s BNZ Startup Alley. Thankyou payroll says Thankyou! WatchMyGear provides real time asset tracking of where a company’s assets were last delivered using an Android app interfacing with a web app. As you can imagine we are absolutely stoked to be selected as a finalist in this years BNZ Startup Alley and look forward to seeing you there! Peoples Coffee are a socially conscious business roasting 100% fair trade and organic coffee out of Newtown, Wellington. Heading into our 10th year we’ve been pioneers in the NZ coffee industry, striving for justice and quality of life for the farmers and the best damn cup of coffee around for you. Peoples are delighted to make a return to Webstock again this year. Fitting in with the amazing surroundings, we thought we’d put on a bit of a show. Webstock is a meeting of great minds and so we wanted to pay tribute to the iconic coffeehouses of Paris 1920’s. When Picasso would rub shoulders with Hemingway and Fitzgerald, sharing ideas, musings and gossip. A bit like the Twitter of the time – #IRL. If you want a fast fix we’ll have two espresso coffee stations cranking out your favourite coffee order, but if you’re after something to sit and ruminate on then visit us upstairs in our Parisian coffee house for some coffee geekery – pour over, siphons, cold brew and maybe something a little stronger, to get those creative ideas flowing. There’ll be four choices of ice cream available. An uber caramel-y ice cream with a dash of sea salt and an irresistible buttery pretzel crunch. Salty and sweet as! A classic from your childhood days, this flavour sneaks colourful gum balls into a creamy bubble gum flavoured ice cream. Two treats in one! A blend of vanilla ice cream and cold American-style root beer. Guaranteed to satisfy any carnival kid! Perfect for the afternoon affogato and the evening liqueur affogato. Oh yes. That will be a thing. Last year’s custom Webstock brew proved so popular, it was inevitable to see it return in 2014. Building on the foam-base from last year, API 2.0 is a ‘Reverse IPA’ where the high alpha acid hops that are traditionally used at the start of the boil, have been pushed right to the end. The result is a unique IPA that is deceptively drinkable yet bursting with hop flavour. API 2.0 will be available for enjoyment at Webstock events and the numerous quality beer bars around Wellington.